This Escalera model features an electric powered stairclimber (1200 lb capacity) with a fork lift. At Handtrucks2go, we have the widest assortment of stairclimbers available anywhere, and we are proud to say that this model is one of our most popular best sellers! Side frames are made from tough tempered aluminum alloy, and the lift frame is made of steel. The forks are 28 inches long and have a lifting height of up to up to 54 inches - high enough to load or unload a semi truck! All Escalera Forklifts have a 1200 pound maximum capacity. There are primarily 2 different models, the removable winch/lift model and the non-removable model. And then there is an option of a hand cranked lift or an electric winch lift. Complete line of accessories available, check out the accessories tab for details. If you are trying to move copy machine consoles we advise to buy it together with the Copycaddy. Click here if you are looking for a Escalera stair climber without the lift. • Model MLA-HC Powered Stair Climbing Forklift with hand operated winch for raising and lowering the forks. • Model MLA-EW Powered Stair Climbing Forklift with battery operated winch for raising and lowering the forks. • Model RLA-HC Powered Stair Climbing Forklift with hand operated winch and Removable Lift Attachment. • Model RLA-EW Powered Stair Climbing Forklift with battery operated winch and Removable Lift Attachment. Typically it will take 7 seconds per step, or 8-9 steps per minute. 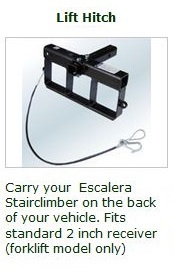 The Escalera can be used to easily load a safe, barrel, and woodstove, into a pickup truck or semi-trailer. Many of our customers want to know how long the battery will last. While this is really dependent on many factors, such as weight, temperature... Generally speaking, it will last for 100-150 steps with the standard battery, and 200-300 with the upgraded battery. (You can select the upgraded option below). We also have 2 more videos on the Escalera Home Page which will help you decide which model and accessories is right for you, and another video showing customer testimonials. A great way to move, appliances, vending machines, boilers, wood stoves, bathtubs, soda machines, mainframe computers, industrial batteries, fireplace inserts, fireproof safes, steel shelves, gun safes, hot water tanks, elevator equipment, all hvac machinery and more! • Hand Truck and Forks - Forks can either be removable or permanently installed, electric lift or hand crank, depending on your choice. • 1 Rewind Belt - The 12 ft. automatic rewinding safety straps on the Escalera Stairclimbing Handtrucks work the same way as a seat belt in a car. They can be mounted at different heights on the hand truck and can easily be used to secure the heaviest of loads. 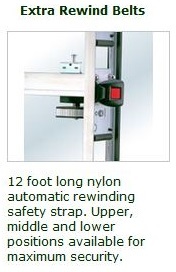 The automatic rewinding safety straps are lightweight, and self-contained. Because they rewind into the side frame when they are not in use, you will never have loose straps dangling down by your feet. A simple to use thumb-style lock secures the strap for tightening. • Automatic Battery Charger - Includes clamps that can be attached directly to battery terminals, and a male/female plug that can be left permanently on the battery for easier and faster charging. Extented Toeplate - The default toeplate measures 4" deep x 24" across. The extended toeplate hooks on top of the existing toeplate (easy on/off) and extends the depth and width. Available in 2 sizes: 12" deep x 28" across or 12" deep x 32"across. Big Wheel Attachment - Hooks on to the back of your hand truck (easy on/off), allows you to roll over rough terrain with the Big Wheel Attachment. 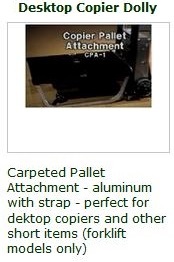 This removable accessory is perfect for moving heavy loads through gravel, grass, thick shag carpet, light snow, and even on flat smooth surfaces. The 10 inch pneumatic tires bear much of the weight of the load as you navigate on four wheels instead of two. Extra Rewind Strap - Every Escalera Stairclimbing Handtruck ships with one automatic rewinding safety strap included as standard. Additional straps are optional. *Please note 3rd extra rewind strap option is only available with the MS-72 and MS-1-72 models. Crossgrip Handle - Adds on an ergonomic cross handle that goes across the back of your hand truck, it attaches to the standard loop handles. Makes using the hand truck much easier. Retractable Load Support - Use the Retractable Load Support (RLS-1) when you need to roll heavy loads long distances. The caster legs fold up conveniently along the side frame when they are not in use. An easy-to-use foot-operated latch releases the caster legs and a locking arm secures the legs in the open position for safe and easy operation. Upgraded Battery - The standard Escalera battery is an 18H while the upgraded one in a 33AH. The upgraded battery which will give you almost double the use time per charge. Many of our customers want to know how long the battery will last. While this is really dependent on many factors, such as weight, temperature... Generally speaking, it will last for 100-150 steps with the standard battery, and 200-300 with the upgraded battery. Spare Battery - We also have a spare battery option, where you can order a standard or upgraded batery. Please Note: If you select this option, make sure that both batteries are the same, i.e. either standard or upgraded, or else you will have a problem with the battery fittings. Padded Rest Attachment - Very important for loads above 60" tall. 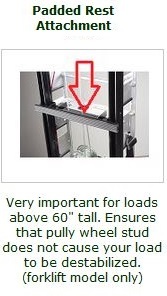 Ensures that pully wheel stud does not cause your load to be destabilized. Lift Hitch - Allows you Carry your Escalera Stairclimber on the back of your vehicle. Fits standard 2 inch receiver. 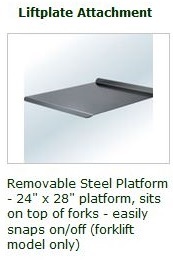 The forks of your hand truck will lock into the fork pockets. Barrel Attachment - Use the removable Barrel Attachment for moving drums and cylinders. 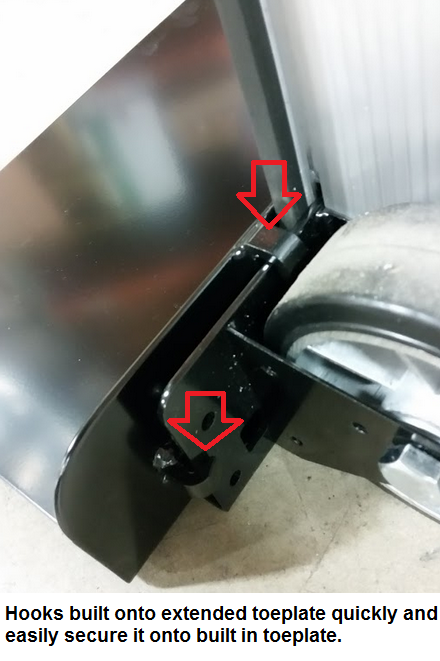 This concave bracket prevents the load from rolling side to side and helps to secure the load to the Escalera hand truck for safe and easy deliveries. 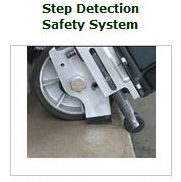 Step Detection System - Designed as an extra safety precaution to work with the Staircat hand trucks. It indicates to the operator when the hand truck is in the correct position to ascend or descend the steps. Simply activate the system with your foot by pressing on the release lever on each detector on both sides. The Detector will indicate the edge of very step by giving you a strong resistance which you will feel. 12V In-Vehicle Charger - Allows you to charge up your Escalera while on the go from your vehicles power. 14 ft. Extension Strap - Connects to the existing belt, adding on an additional 14 feet of length, for those extra big loads. Portable Steps - Available in a variety of heights, this will allow you to easily bring your Escalera hand truck and its load in and out of your vehicle. If you are interested in ordering the Coppycaddy Phoptocopier Dolly make sure to order it together with your Escalera for extra savings (To take advantage of this please call us at 888 - 811-5941). Please Note: 1) Extented toeplate can only be used with removable frame models, when the winch lift is removed. 2) Upgraded Battery option is only available with hand crank models (Electric lift models come standard with upgraded battery). Very high quality ! Very usefully for many different aplications ! I have used many different hand trucks and wheelers for over 40 yrs - this is very versatile! Advantages: Stairs and heavier items I can’t normally handle ! Disadvantages: With electric option a little heavy ! Looks very nice and easy to move around. Advantages: It's help us carry our A/C unit up stairs without any problems. I bought this staircat handtruck after careful consideration and comparing features and quality of build. Upon receiving my unit I noticed how superbly it was packaged against damage, and like the functionality and design of the forklift accessory as well as the ease in which the battery can be charged and maintained. One can see immediately the attention to detail the company pays to ensuring the final product is built for heavy duty operation. I'd recommend this unit to anyone! Advantages: I compared the features and build quality of the staircat against other handtrucks that are suppose to do the same job, and the competition costs a lot more and doesn't have forklift feature I wanted for loading and unloading a truck. That was important to me and is why I chose the staircat. I got our new hand Escalera Motorized Stair Climber hand truck last Friday 4/27/2018. We sell Commercial water heaters and have to go up and down stairs with them. It is an amazing handtruck and my guys are very happy with it so far. Advantages: Makes moving heavy items easy. Disadvantages: None that I have found so far. This stairclimber with forklift is the way to go, I'm in the Plumbing & Heating business and have been using regular dolly's to move equipment up and down steps and lifting by hand into my truck, no more back pain and struggling up and down steps. Advantages: Allows me to not damage the stair well and steps, saves my back from breaking, no damage to steps or risers, no more damaged walls, can transport using the hitch attachment, stairclimber is not welded so if a side rail gets damaged you can buy that part only not the whole unit. Disadvantages: There are none this stairclimber is a win win all the way around a know brainer. Ordered it they were very helpful with my questions talked me through the process. Good customer Service I would say. Advantages: Well built easy to use, accessories go on and off easily. The big wheel kit rocks. Disadvantages: Heavy, but I'm guessing it has to be to hold up too 1200 lbs. My name is Bruce Powers and this is my review of the hand truck our company bought about 2 months ago. This hand truck is great for your back and all your body parts. This little hand truck is a great for lifting all kinds of items with out hurting yourself. I work for a detention facility and before I had to build a wooden ramp and take a run at the ramp to move fire proof cabinets that can weigh up to 800 lbs up the ramp and I paid for it with pain in my knees and hip. Yesterday with the Escalera hand truck I backed up to the curb and with the mini fork lift design and the hand crank I was able to easily lift the fire proof file cabinet above the company trucks tail gate and slide it off on to the bed of the truck and I had two guys helping me. The other use for this hand truck is lifting heavy items in the shop like tires and cutting edges for the roads departments motor grader so you can say it's like having a extra hand too. Advantages: Very easy to use, my coworker didn't even read the instructions and was able to use the stair climber option to go up a set of stairs with the fire proof cabinet so I recommend getting 1 so you don't get hurt and have to get work men's comp. This is a excellent forklift replacement for lifting appliances besides for climbing stairs. Makes the heavy lifting so much easier. A must have if you work alone. Advantages: Good battery life. Very strong lifting power. Big wheel attachment makes rough surfaces traversable. Disadvantages: Wide door jams at the tops of stairs make things tough because the climbing feet will not get you over them. Advantages: great back saver. very strong and durable. should have purchased one 10 years ago. Disadvantages: Needs a ratchet strap. the seatbelt system does not take out all the slack and the load jumps. We added our own ratchet strap and load stopped moving. It works great for bringing pumps and other heavy items up stairs. Advantages: Saves people from getting hurt, work comp claims, and being off work. Disadvantages: I have not come across any. I bought this handtruck back in oct. 2016 .I wanted to wait to do a review to see how it worked .well it works great ! I have moved 400 lb safe ,300 lb treadmills ,wood swing sets in the box ,and much more .Walks up stairs with no problem and down . It is agreat tool to have .I also got the big wheel attachment with it ,a must have ,they are very handy. Well made, simple to use--just as advertised! Advantages: Keeps your delivery people productive and happy--and avoids the workman's comp claims! I am very impressed with the construction of this handtruck. The stair climbing ability seems to work perfectly. As well as the forklift capability. 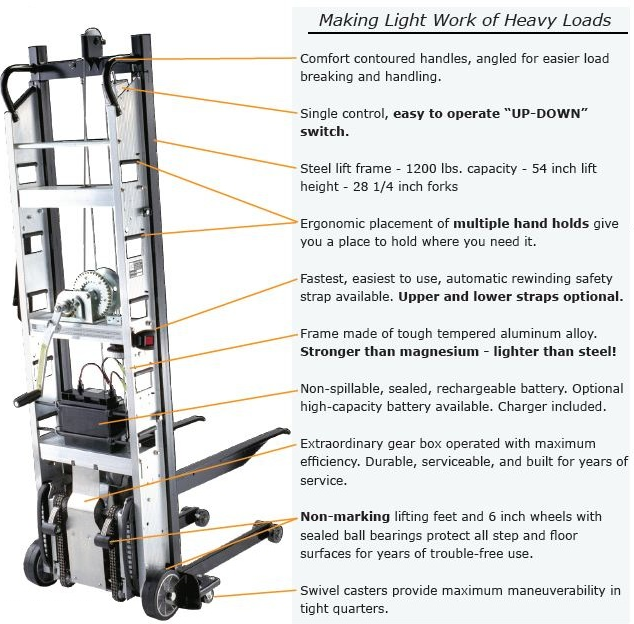 Advantages: The advantage to be able to save the wear and tear on our backs by having a handtruck that ,not only climbs stairs on its own as well as being able to raise products up to be placed on a platform is priceless. Super tool. One must be very careful to ensure you don't skip a step... practice! many times with light loads to be sure you have the hang of it. Biggest issue is the seat belt strap which after a weeks use doesn't pull its self back in all the way. We here at Air technology move alot of heavy equipment. The Escalara stair climber is totally awesome. We move water heaters and boilers in and out of houses all day, and we find it to be a real back saver. Disadvantages: I lift weights for my personal goals but my men that work for me don't, so they have a hard time lifting up the unit into the truck. Handtrucks2go Specialist: Instead of lifting it in and out of the truck, simply lean it against the bumper and push the handles down towards the floor when bringing it into the truck, and slide it down when taking it out. The equipment we ordered works great. I haven't had a chance to use it a lot yet but intend to. Super excited about its operation so far. Advantages: Will allow us to move equipment more easily. Disadvantages: Haven't found any so far. We are a full service HVAC company and provide extensive removal of heating and air conditioning equipment. The Escalera Staircat stairclimber is the best tool I have in my tool bag. I'm telling and showing everyone my new toy. I can not believe I was working without one all this time. I love the product my (2nd purchase) of an Escalera, the first being from another distributor. I have to say that I was VERY happy with my entire purchase experience with Handtrucks2go. The process was quick, seamless and professional and it far exceeded my expectations and I would definitely recommend the product and I would absolutely suggest you do the deal with Handtrucks2go. Davis Business Machines purchased an Escalera Model RLA-EW on 8/5/2016. It has worked flawlessly. We use it to move copiers up and down stairs and it is GREAT. The forklift attachment is FANTASTIC. The ease of working the stair lift and forklift is AMAZING. We couldn't be more pleased with our purchase. We have used the hand truck two days ago and we love it it will come in very handy in the future for moving boilers and heaters in buildings and homes where there are no elevators and we must use the steps. They had what we were looking for at the best price. Disadvantages: Product did not ship by the specified day. This delayed our own work schedule. Handtrucks2go Response: We apologize for the unexpected delay. Once in a while we just get so many orders in that we fall behind the expected ship date. The guys came in on Sunday to catch up to schedule to get these units out. Superior product, purchased this to move 400lb batteries up 10 steps. Worked flawlessly. Do your homework and learn what each accessory is offered, I ordered many of the accessories, this item will pay for itself. So far, so good, Had the opportunity to use it one time on a 450 pound load and it went well. Trying to learn how to balance at the right angle and also hold and run switch. Advantages: No workmans comp claims, easy to maneuver around when on the ground and strong for lifting at high angle. I have bad knees and going up and down stairs is hard on me. I have a load of 5 to 7 computers on my old hand truck all I could think of was am I going to have enough in me to keep them from falling down the stairs. Now with the Escalera Motorized Stair Climber With Forklift Handtruck I do not worry I just let stair climber do it job with little effort on my part. Advantages: When I get back to the shop the fork lift allows me to put my stuff away on shelves with little to no effort also on my part. Disadvantages: The only problem I have is loading the Escalera Motorized Stair Climber With Forklift Handtruck into my trailer I do not have a ramp and the Escalera Motorized Stair Climber With Forklift Handtruck is just a little bit to short for the stair climber to be able to work. I have now gotten a ramp and loading and unloading is no problem now. Advantages: It will save your back. I should have bought it long ago. Great customer service. Order was fast. Shipping and speed was great. Product was crated and protected well when shipped. Just what we needed. Thanks for your help! Awesome stair climber unit pick up a 650 lb boiler with no problems,unit well made ,wished I had one years ago, what a back saver!!!!!! Equipment and customer service could not have been better. Very helpful in determinig what equipment would fit our needs. Product support has been great. If you move appliances this handtruck is a MUST HAVE! Great customer service and communication. Great product!!!!! The only negative is we didn't get it sooner. Steps are truly a breeze. We added the big wheel attachment which is wonderful, making gravel drives, yards, etc. easy. When on a smooth surface, the retractable load support makes any size item a one man move. The step detection system takes some practice and has not been beneficial to us yet. In order for it to work, the truck angle has to be right which is not always possible. The hand crank lift is great and easy to remove. Handtrucks2go has quick response time and seems to have excellent customer service. "Seems" because outside of the purchase and a couple of questions afterward, the transaction was so smooth I haven't needed any customer service!!!! We just received this product and our customers are very happy we have one to move gun safes and aquariums. They thought it worked great for moving up the steps. Feels like very high quality, easy to operate, quality built â€“ what more can I say? This is a great product and really increases productivity, prevents back injury and its easy rolling design protects even the most fragile items. Fantastic product! Climbs stairs well but if you are taking an appliance up stairs and need to turn the corner at the top of the stairs although the unit, does swivel in its place, there is no where to put your foot to maneuver the unit to swivel or turn the unit. It lifts great we stack appliances on top of each other. We also use it to work on items with the stacker lift add-on. Best thing we have ever bought for our store.. Works like a charm!!!! I really like this unit. I am still learning it but with everything I used it on has been great. It has taken a lot of work out of moving things both up and down stairs. I love the actaul mechanics and use of this product. However, the straps do NOT get tight. Really need to be a ratchet style. Like the seatbelt thought process but here again there is no way to tighten. Great service. Very helpful. The hand truck will be very beneficial for moving my pinball machines and jukeboxes up and down the steps in buildings where there are no service elevators. This stair climber is high quality and very easy to use. The lift attachment installs and removes in a minute. Only regret we didn't purchase one sooner. Would have spared some aching backs and worries about injures to our employees. *Please note: If you plan on ordering extra rewind straps, please specify (in customer notes by checkout) which position you want them in. Available positions are at 18" , 33" and 48". 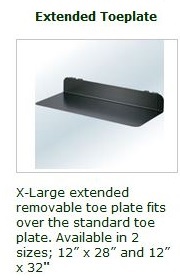 X-Large extended removable toe plate fits over the standard toe plate. 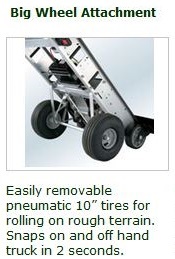 Available in 2 sizes; 12” x 28” and 12” x 32"
Easily removable pneumatic 10” tires for rolling on rough terrain. Snaps on and off hand truck in 2 seconds. 12 foot long nylon automatic rewinding safety strap. Upper, middle and lower positions available for maximum security. 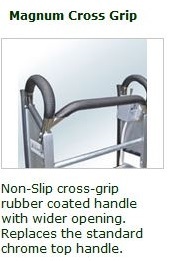 Non-Slip cross-grip rubber coated handle with wider opening. Replaces the standard chrome top handle. 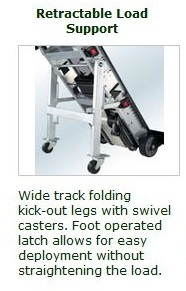 Wide track folding kick-out legs with swivel casters. Foot operated latch allows for easy deployment without straightening the load. 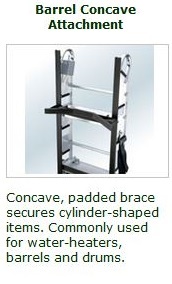 Concave, padded brace secures cylinder-shaped items. Commonly used for water-heaters, barrels and drums. 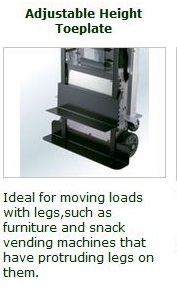 Ideal for moving loads with legs,such as furniture and snack vending machines that have protruding legs on them. 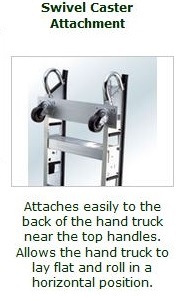 Attaches easily to the back of the hand truck near the top handles. Allows the hand truck to lay flat and roll in a horizontal position. 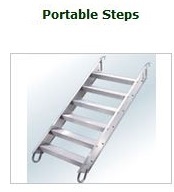 Aluminum Portable Steps - Avoid the need of buying a liftgate, also an alternative to the hitch lift. "I must say your online site was a real pleasure to shop on. Your clear pictures, videos and straight forward pricing which included free shipping, will make me a loyal customer. Love their hand trucks and dollies as well as their customer service. I pruchased their Adjustable Pallet Dolly which we used to help our workers from back pain and injuries due to bending over multiple times when moving product from laser table to sandblaster. We find their website extremely helpful and affordable. Will defintely be back to purchase more! Handtrucks2go has never failed to bring us excellent service regarding our stairclimbers and additional accessories as well as other products that we have purchased from this website. This is most defintely our go-to website when it comes to material handling equipment. The Escalera Stair Climber Hand Truck from Handtrucks2go is undoubtedly the best electric appliance hand truck in the market so far. Our moving company (Rescue Moving Services) just purchased this great appliance hand truck in bulk and we have been using it to move appliances, office cabinets, furniture and more ever since. These were shipped quickly and arrived in good shape and quality. We really recommend Handtrucks2go to everyone defintely it's worth every penny!